Citus is well suited to hosting B2B multi-tenant application data. In this model application tenants share a Citus cluster and a schema. Each tenant’s table data is stored in a shard determined by a configurable tenant id column. Citus pushes queries down to run directly on the relevant tenant shard in the cluster, spreading out the computation. Once queries are routed this way they can be executed without concern for the rest of the cluster. 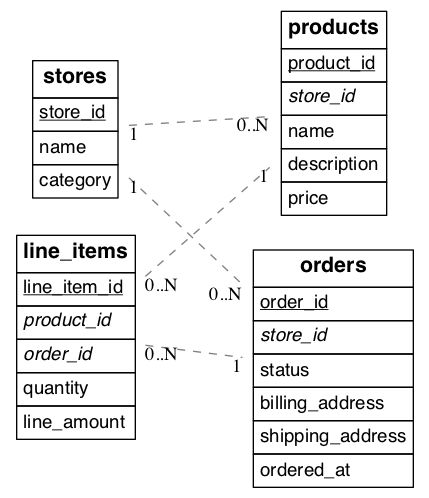 These queries can use the full features of SQL, including joins and transactions, without running into the inherent limitations of a distributed system. Transitioning from a standalone database instance to a sharded multi-tenant system requires identifying and modifying three types of tables which we may term per-tenant, reference, and global. The distinction hinges on whether the tables have (or reference) a column serving as tenant id. The concept of tenant id depends on the application and who exactly are considered its tenants. In our example each store is a natural tenant. This is because storefronts benefit from dedicated processing power for their customer data, and stores do not need to access each other’s sales or inventory. The tenant id is in this case the store id. 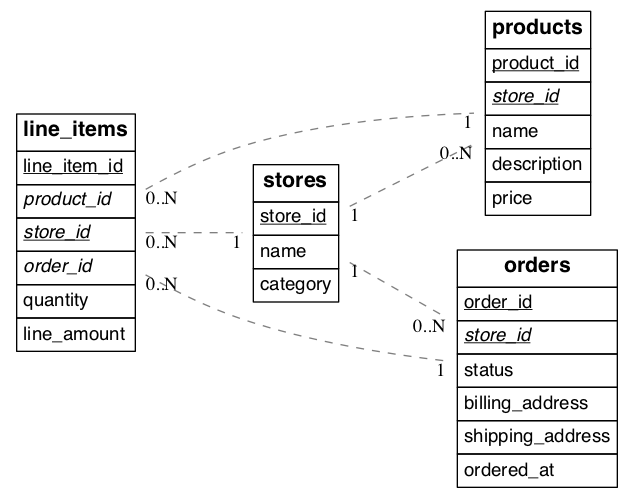 We want to distribute data in the cluster in such a way that rows from the above tables in our schema reside on the same node whenever the rows share a store id. The first step is preparing the tables for distribution. Citus requires that primary keys contain the distribution column, so we must modify the primary keys of these tables and make them compound including a store id. Making primary keys compound will require modifying the corresponding foreign keys as well. In our example the stores and products tables are already in perfect shape. The orders table needs slight modification: updating the primary and foreign keys to include store_id. The line_items table needs the biggest change. Being normalized, it lacks a store id. We must add that column, and include it in the primary key constraint. We call the tables considered so far per-tenant because querying them for our use case requires information for only one tenant per query. Their rows are distributed across the cluster according to the hashed values of their tenant ids. There are other types of tables to consider during a transition to Citus. Some are system-wide tables such as information about site administrators. We call them global tables and they do not participate in join queries with the per-tenant tables and may remain on the Citus coordinator node unmodified. Another kind of table are those which join with per-tenant tables but which aren’t naturally specific to any one tenant. We call them reference tables. Two examples are shipping regions and product categories. We advise that you add a tenant id to these tables and duplicate the original rows, once for each tenant. This ensures that reference data is co-located with per-tenant data and quickly accessible to queries. Once the schema is updated and the per-tenant and reference tables are distributed across the cluster, it’s time to copy data from the original database into Citus. Most per-tenant tables can be copied directly from source tables. However line_items was denormalized with the addition of the store_id column. We have to “backfill” the correct values into this column. We join orders and line_items to output the data we need including the backfilled store_id column. The results can go into a file for later import into Citus. -- This query gets line item information along with matching store_id values. -- You can save the result to a file for later import into Citus. To learn how to ingest datasets such as the one generated above into a Citus cluster, see Ingesting, Modifying Data (DML).